Anointing of the Sick is a healing sacrament of the Church and can be scheduled for anyone who is sick or in need of surgery by calling the Parish Office at 330 385-7131. If possible, the sacrament should be requested at the beginning of an illness so the person can participate actively and fully. The presence of family members and others from the community highlight this prayer of the Church as a healing encounter with the Lord. There is no limit as to how often an ill person may receive the sacrament. If you or someone you know would like to be on the Holy Trinity Parish prayer list please be sure to contact the parish secretary at the Parish Office listed above. Please refer to the Holy Eucharist/Mass page. 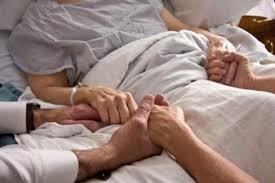 If there is anyone near death and their wish or the family’s wish is to have the Prayers for the Dying, please contact the Parish Office at 330 385-7131 and be sure to let a staff member know that it is an emergency. Holy Trinity Parish has wonderful Extraordinary Ministers of Holy Communion who will distribute the Holy Eucharist and convey the prayers of the Church to those who may be sick, homebound or in a hospital or nursing care facilities. To request Communion please contact the Parish Office at 330 385-7131.